Do you want to learn more about Wicca, its origins, beliefs and rituals? We will tell you everything about the neo-pagan religion. Come and check it out. Wicca is a neo-pagan religion created by Gerald Gardner and it has its influences in the pre-Christian beliefs and practices of Western Europe, where the existence of supernatural power as magic was quite accepted. What is Wicca all about? Wicca is also refered to as “The Art”. It preaches love and joy and it is considered to a shamanic religion and this is due to the fact that Wicca followers defend the existence of worlds parallel to ours. They even find it possible to get into contact with beings that belong to those parallel worlds. Unlike the idea that God created nature so it could be dominated and exploited by the mankind, the Wicca followers value the nature pretty much and they believe that we are a part of it and not superior beings. Also, the woman has a prominent role in witchcraft, because, as a mother, she represents the personification of the Great Mother Nature. The founder of Wicca was very fond of anthropology, history, occult science and archeology. Gerald Gardner also had contact with Freemasonry and he not also liked but he in fact read about the pagan and Celtic rituals that were held in Britain. So, he upgraded the ancestral knowledge of witchcraft to the twentieth century and called this practice Wicca. The word comes from “wicce” that would give the word “witch” in the English language and wise, wisdom. One Gardner’s main goals was to disassociate the evil from witchcraft which was an idea created by Christians. In order to do so, he emphasized positive values about the knowledge of nature, rather than mysteries. But witchcraft was persecuted by the Christian for a long time and until the 1950s its practice was prohibited in the United Kingdom. But not all those who claim to practice a neopagan religion are Wiccans. Wicca is just one of the pre-Christian religions that has surfaced. In the famous pre-historical monument Stonehenge, we find another example of a neo-pagan religion where non-Christian festivals are held. What do Wicca followers believe in? In the neopagan religion Wicca it is believed that there are masculine and feminine gods. The masculine ones are called Cernunnos or Cerunos and feminine, Mother Goddess. The Mother Goddess is seen as the creator of the Earth, the Universe and of life itself. She can be represented by the moon, she is the exaltation of fertility, she is knowledge, she is the cycle of life, of birth, life, death and regeneration. Cernunnos or Cerunos is also known as the Horned God, the spouse of the Mother Goddess. He is a god that is born, dies and reborn, as well as life, seasons and plants. He is associated with male virility and was mistakenly identified as the devil by Christians. Wicca followers also believe in reincarnation and in the Triple Law, by which all human actions return even more intensely to those who have practiced them. They reject the idea of the personification of evil. 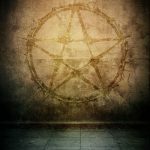 What are the Wicca symbols? The pentagram is a five-pointed star that is seen in various other religions and cultures and it is also found in Wicca. It represents the five elements, the masculine and feminine, the union of the cosmos, among other things. The pentacle is the figure of a pentagram within a circle. It is an object found on altars and used in rituals, spells and incantations. The triple moon is the symbol of the three stages of the Mother Goddess: Maiden, Mother and Elder. They are directly related to the phases of the moon: crescent moon, full and waning. How are the Wicca rituals? The rituals of Wicca depend on the phases of the moon, the Solstices and the Equinoxes. There are practices for large, small, or even individual groups. For them to take place it is essential to have a tidy altar and the environment around clean. Before starting the ritual, everyone taking part in it, must know in advance what their function will be, so that no energetic, physical or spiritual dispersion occurs. A circle is done and by the time they start making the circle, one must summon the elements and the deities. In the end, the circle will be broken and little by little the participants will return to the present. It is allowed to serve some food or drink to aid in relaxation at this time. The experiences that occured during rituals should be written in the Book of Shadows, a type of journal of practitioners of pagan religions. Spells for love: which one do you need? Biomagnetism: what is it and how can it help you?